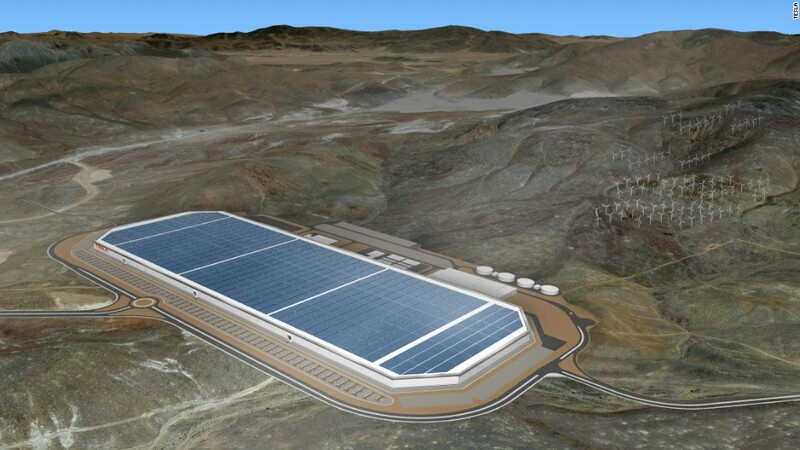 Tesla committed billions to build its ginormous "Gigafactory" in the Nevada desert, which began producing lithium-ion batteries last month. Now the company wants to open more locations. Tesla (TSLA) said Wednesday it expects to "finalize locations" this year for as many as three new Gigafactories. That would bring the total number to five, including a solar plant in New York. It's unclear if the new factories will be as large or costly as the 5.8 million square foot Gigafactory in Nevada. Tesla also plans to double the number of Supercharger stations in North America in 2017, boost production of solar tiles later this year and begin production of the Model 3 in July, according to its fourth quarter earnings report. These efforts may lay the groundwork for Tesla, which recently completed its acquisition of SolarCity, to become a true sustainable energy giant -- but it comes at a cost. Elon Musk, Tesla's CEO, now says it's possible the company may need to raise more money. "No capital needs to be raised for the Model 3, but we get very close to the edge," Musk said. "So we're considering a number of options, but I think it probably makes sense to raise capital to reduce risk." If the capital raise isn't enough to unnerve Wall Street, a sudden change in Tesla's C-Suite might be. On a conference call with analysts, Tesla CFO Jason Wheeler announced plans to leave the company in April for an unspecified role in the public sector. Wheeler will be replaced by Tesla's former CFO Deepak Ahuja. Tesla posted a loss of $121.3 million for the quarter, less than a year earlier, but breaking its all too brief stretch as a profitable business. It had reported a rare profit in the previous quarter after Musk implored employees to slash costs and "deliver every car we possibly can." Musk had said Tesla might be profitable again this quarter, but it was not to be. Tesla stock was up 2% in after hours trading Wednesday following the earnings report. The stock has surged 30% this year on investor optimism for the launch of the Model 3, its first mass market car. "The Model 3 is designed for manufacturing," Musk said on the call, to ease concerns about hiccups in production. "A lot of the bells and whistles ... are not present on the Model 3. These reduce the risk substantially in the ramp and make it easier to scale." Tesla's stock has also benefited from Musk's relationship with President Trump. Musk now serves on two of Trump's advisory councils and has visited Trump Tower on multiple occasions. "We believe this level of coordination with the new administration could actually evolve into greater strategic value than with the prior administration," Adam Jonas, an analyst with Morgan Stanley, wrote in an investor note last month.